Look at me – I’m all grown-up: I have a new and cleaner looking blog design (I had to do it since WP has retired my original theme), use a real poll and even got my first guest writer! Please welcome hajusuuri – a perfumista, my close scent relative and a regular commenter on many perfume blogs. Tell us about your spontaneous perfume purchases (whatever this means in your book – be that purchasing a bottle the same day you tried the perfume for the first time or getting the perfume from the bottom position of your wish list). To celebrate her first guest post on this blog hajusuuri offers a 5 ml decant of Atelier Cologne Silver Iris. This giveaway is open to everyone worldwide. To be entered vote in the poll and leave a comment telling in what country you live. If you do not want to be entered still vote, please. The giveaway is open until 11:59PM PST on March 1st, 2014. The winner will be chosen via Random.org and announced in the February Statistics post. Please note that neither Undina nor hajusuuri is responsible for replacing the decant if it were to get lost or damaged. Hilarious post! And who knew that some brands offered such a startling and eclectic range of giveaways…the creepy doll is magnificent. “Resistance is futile”, Vanessa. Listen to your heart and go for it! Thanks for visiting. Should we enter you in the draw? Oh sorry, yes please, H. I am in the UK. Posting a review of this latest lemming tomorrow…I will try to resist, or stalk on eBay, promise! Nowadays, I’m mostly buying on vacation because I won’t have the chance afterwards (how I came home with Dries Van Noten from Vienna). Very rarely if it’s a deal because I’m trying to cull my collection, not add more to it and those deals come regularly. I can absolutely see how a traveler from a city or country that has limited distribution of niche perfumes will (should!) take the opportunity to buy while on vacation. As an aside, Dries did not work for me :-( and I wanted to love it oh so much! You are entered in the draw, Ines. As to the Hermessence, would you believe I don’t have a set in my collection? The reason was indecisiveness! There were too many options and I could not decide on the perfect four! Hajusuuri!!!! Love the post! Such a wit. I answered the poll, but the general answer is “I make spontaneous purchases typically because of a change in the breeze”…in other words, because I feel like it and unfortunately that’s most of the time! U – I love the new look. It’s wonderfully clean and calming! OH, and now that I see that By Kilian atomizer….I want one too!!!! Dear Daisy and I visited the By Kilian boutique last week and that atomizer was calling out to me ever since I saw the Bunch o’ limited edition bottles post at NST! It is purty! Hello Steve! Just like you, I don’t ever plan to be spontaneous when it comes to buying perfumes, I just do it! I make more blind buys than spontaneous ones. If there’s a sale or GWP, I’m a sucker almost every time. I still need to make a blind buy of Marni just for that doll. It’s great to see you here as a guest poster too. Poodle! Thanks for the welcome. I’ll stay silent on which type I have more of: blind buys or spontaneous buys. We can be perfusinner sisters. That Marni doll IS addictive and really cute in her own way. Sure, enter me. I’m in the US. Lol. I’d love to be a perfusinner sister of yours. It’s cold, I’m cranky and I might just buy that doll/perfume when I get home from work. I want to put her on my desk. Maybe she’ll scare away some of my coworkers or at least make me laugh. Creepy Marni doll will scare away your co-workers AND make you laugh. Do it…do it…mwahahahaha…. And, you’re in the draw! I love the site redesign too! Looks terrific, Undina! And loved the guest post Hajusuuri! My first reaction was, ugh, I don’t buy spontaneously. But then I realized that I was just fooling myself because I do! For all the kinds of reasons that you pointed out. The number one thing that someone can say to me to motivate me to get out my credit card is that XYZ is being discontinued! Hello Daisy! The site looks, great, I agree! Besides Guerlain Iris Ganache (I think you got the last bottle at Saks), which other discontinued perfume had you bought? My one other discontinued brick & mortar store buy, but not spontaneous since I got a decant via a swap, was L’Artisan Tea for Two (at full price and no deal). Impulse buys are often discontinued but a great bargain will get me too. EVERY TIME! Hello Portia. Thanks for the warm welcome! The “bargains” always get me, too. My most recent regret was not taking advantage of the great $s off promotion at Bergdorf but the sweet spot was a cool $1,000 and I just could not justify spending that much on perfumes in one shopping spree. If I Iiked a Roja Dove well enough, it would be a different story…. No no, DNEM please but yes, $1000 in one spree is a LOT! Hey Hajusuuri! I have only made one impulse buy in my life, Fleur dÓrange or whatever it´s called from Serge Lutens. That was worth the money because I have never made one again. Hello Val! Buying SL Fleurs d’Oranger (I had to look it up) was like touching a hot stove – never again! You are so disciplined (well, besides Undina), in not making spontaneous buying a way of life – good for you. Love the look of your new blog page! I am so glad to hear that others make spontaneous fragrance purchases for the same reasons :) I live in the US, and thanks so much for the giveaway! Spontaneous buyers, Unite! Thanks for visiting. You are entered in the draw, shuvanidev. First of all – let me compliment on the new look! I just LOVE the touch of green that a new design has, and I adore the picture of the pond with water lilies in the header. Hi Hajusuuri, so cool to see you at Undina’s spot as a guest writer. I have never bought a perfume spontaneously, the most spontaneous purchase for me was Tauer PHI, which I ordered 2 weeks after getting a sample of it. I just cannot afford to make a mistake in bying something that I might not love. Great pictures – so did you manage to buy an EMPTY snake travel spray from Kilian? And that snake bracelet is so cool! Thank you, Lucas! I can proudly say that it’m my own picture of the pond, not a stock photo! I was also wondering if for $150 it came empty or filled in. It actually came with one 25 mL atomizer but I got 2 because of the SA’s mistake in quoting the price. I think there is some kind of law (the Universal Commercial Code, maybe?) that says If the price was mismarked on the item, the store would have to honor the lower price or it is considered false advertising. Come to think of it, I don’t recall price tags on the displays…the more to give the impression that if you have to ask, you can’t afford it! I knew it was your photo! After I’ve seen those maple leaves on the water in your post about rain it was obvious that it’s your own shot. Hello dearest Lucas! I love the new look as well. Undina did a great job! Tauer PHI – Love! Ahem, I went for a 15 mL Explorer Set “sample” and fell in love with it immediately. It took you two weeks to decide whereas it took me 1 day from first sniff to online order. It’s a good thing I did it quickly because it is now out of stock and will begin to be available in the third quarter this year. As to the atomizer, no, I did not buy an empty atomizer. It came with a filled atomizer (I chose Good Girl Gone Bad) and because the SA quoted me the wrong price, he made amends and gave me a second refill. I know that one can’t really thoroughly clean an atomizer so I am on the lookout for just the right sized .25mL atomizer. The snake bracelet is so easy to wear and is one my favorite accessories! I would love to be entered in this generous draw – I’m in the US. Hello Sally M! Thanks for the warm welcome! I looked up The Perfume House and saw that it is Portland, OR. My brother lives in a suburb of Portland and I have to visit The Perfume House when I’m there! Do you think SAs stretch the truth sometimes just to close a sale? As to blind buys, my lips are sealed. I’ll add you to my perfusinner sisters list. Oh you must go to the PH – its a fantastic place! I wouldn’t be at all surprised if SAs spin a tale to close a sale although to be fair, the SA at the PH (Tracey) is really great and it would disappoint me if she did. It would be interesting to go back and see if there are anymore SdeMs there now as I supposedly bought “the last one available to them” – there were also no Bois de Vanilles as they had sold out over Christmas but had been able to order more. I’ll make sure to go visit! My brother is a scent phobe like my mom so I try not to overdo it but it’s pretty hard when you’re cooped up in a car with the windows closed! I do not trust SAs any longer: on more than one occasion they gave me wrong information trying to get the sale. I consider a purchase spontaneous if I buy it without long planning and having that perfume to be on my “to buy” list for a long while. Usually it happens when I find a really good % off deal (and free shipping and/or extra goodies makes it even easier to “jump”). Hello Undina. By the way, thank you for the opportunity to debut at the same time as your blog’s new look and banner – I love it! Nowadays with % off, at the brick and mortar stores, I try to go for the equivalent of 20% off or more but that is rare and/or it requires one to spend in the 4 digits! I’m not sure I’ve ever seen % off fragrances at real stores (even Saks – the only store that has from time to time discounts that go for beauty products as well – usually has it for online purchases) – that’s why I usually buy online, after careful search. 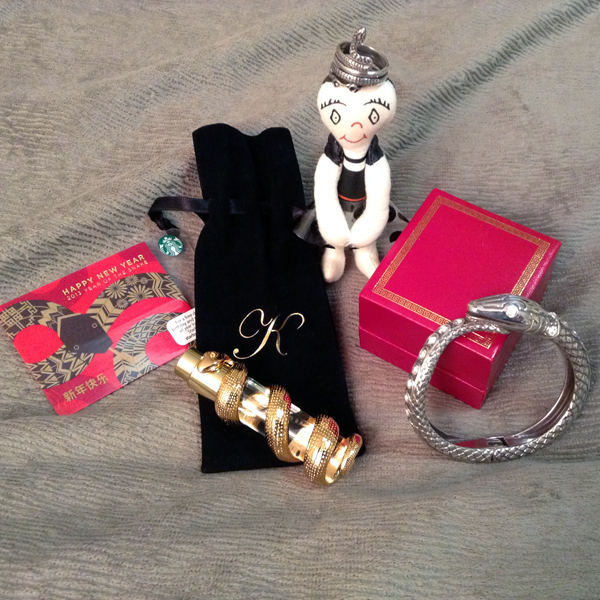 Volutes that I bought at Nordstrom was full price but I always get goodies from the friendly SA – so I try to give her my business from time to time – and it was either a 3 or 10 points day – so I got some “cash back” from it as well. In any case, Lord and Taylor occasionally has 10% off the beauty / fragrance lines during their friends and family days. Nordstrom will actually match the 10% off at the same time; just bring the newspaper ad or the coupon. I also once managed to get 20% off from Nordstrom because Sephora was having its 20% off days as well…and come to think of it, I used THAT 20% to get Silver Iris! Congratulations on the new look and design, Undina. It’s very fresh and delicate. Thanks for the warm welcome, Kafka! That snake atomizer was really eye catching and I just could not leave the boutique without it. Oh, and that clutch with the snake? Daisy and I could not resist caressing it. Now, inquiring minds want to know which Annick Goutal cured you of spontaneous purchasing! Thank you, Kafka! As I said, I was nudged to change the theme (the old one had some bugs with new features that they didn’t plan to fix since the theme was retired) and then had to use the header without the blog name on it. But I like the result and I think I can live with it for a while. Loving the new look, Undina! As for spontaneous purchases, I don’t make so many any more but when I do it tends to be a fortuitous mix of finding something I like and having the disposable income at the time. Recently my purchases have been to top up on things I’ve run out of. I guess that shows that I’m actually using some things up! Hello Thomas! I agree that desire (like/love) + disposable income mix well :-). As to topping up, these days, it would have to be something I could not live without and the only current one I considered as such is Sonoma Scent Studio To Dream (but I don’t use enough of it to need a back-up yet). They mix very well indeed! I agree re that any top ups have to be the ones you cannot live without. My most recent ones are Hypnotic Poison, Insolence and Juicy Couture. To Dream is beautiful! Lovely guest post! Really enjoyed reading your on-the-spot buys hajusuuri. You got some great daals. Any regrets I wonder? I bought Coeur de Vetiver Sacre recently because it was being discontinued and don’t care for it but that’s probably more because it was a blind-buy. I sometimes buy things if they come up on Ebay at a good price. Generally not a very spontaneous buyer it has to be said. Undina – love the new look and it is easier for me to read too. The right-hand coloums used to float across and cover a bit of the main text – on my browser anyway. Adore that lily-pads photo too. I also bought Coeur de Vetiver Sacre because it was being discontinued and it was 50% off but it did not make it as a spontaneous buy because I had previously sampled it and liked it. Thank you, Tara. You should have told me earlier about the readability issues though: I suspect that theme didn’t play nicely with later versions of some browsers. With how much I hate changes the hardest part was to let the blue color and ocean go but I like how it looks now and I will get used to it. Thanks, Natalie! You may call me Haju…but to get the full effect, Hajusuuri = The Big Stink (as a native Finn once politely explained). I answered the poll with “I do not make spontaneous purchases” but that only applies to full bottles, not decants ;) And, in truth, the not rushing into full bottles was a lesson that was very hard won through buying far too many bottles two minutes after a single spray test, only to discover that I don’t really love them much at all. And I have too many bottles anyway – I need to sell some, not buy more! Hello Sarah! So you used to do it and not anymore? Good for you…I think I am hopeless when it comes to spontaneous purchases! No need to enter me in the draw, thanks. I think I’m only managing to stop myself from spontaneous buying because I have 3 good reasons not to. Beside the fact that too many of my previous spontaneous buys turned out to be things I don’t really like, perfume is seriously overpriced in the shops where I live and I have been able to satisfy my love for the new with lots of decants instead. I just “discovered” decants and splits in 2012. I was always leery of provenance but have since gotten over my phobia of the unknown. Please enter me in the draw, I live in Norway. I do at least half of my perfume shopping abroad. One reason is the price level, another is the fact that Serge Lutens, the exclusives from Chanel , Tauer and many more brands are not sold here. So even if I plan ahead I am sometimes a spontaneous shopper when on holiday. We also have heavy custom clearance fees when buying from abroad, so online shopping is not really such a bargain. I have only been seriously interested in perfume for some over 3 years, so far I think I manage to keep the buying at a reasonable level. But getting hold of interesting samples soon adds up, so I try to keep track of that spending, which is more easily forgotten. There seems to be untapped markets in pockets of all over Europe but great that you have the opportunity to acquire them on your trips! I wish airports have a better selection; in my opinion, the distribution cost to airport shops have got to be better than a store in town, all the more to tempt perfumistas. You’re entered in the draw, Ingeborg! 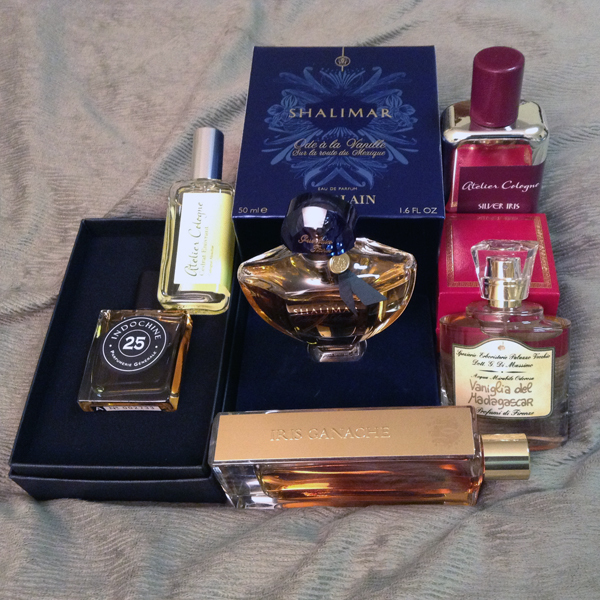 Most of my perfume spontaneous purchases fall under the “do I really need (or have?) a reason” category, I think. Perhaps it would be more appropriate to call it “but I don’t own this yet and wouldn’t it be nice?” category :) This is why I have a perfume budget, and this year I blew my whole budget by the end of February… I am in the US, and thank you for the draw! Last year, I started the year with good intentions and ended up with 2 Guerlains by the 2nd week of January (and the 3rd one by the end of the month)…not to mention 5 Atelier colognes. Needless to say, I decided not to set one this year and I’ve spent a lot less this year compared to the same time last year. You’re in the draw, Nemo! hajusuuri, so glad to see you’re here! I’d dropped out of the perfumed web for a time, missed your debut, and only just now spotted it. What an excellent addition.